Texdata International - STOLL in Africa, a success story! STOLL in Africa, a success story! 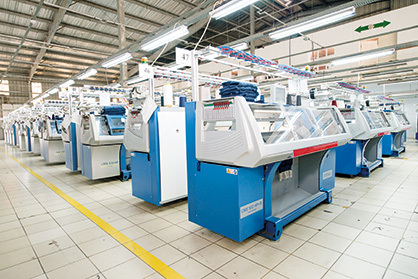 H. Stoll AG & Co. KG, the leading manufacturer of flat knitting machines based in Reutlingen, has been working with the African market for over 40 years. The success story in 3 parts. Madagascar, compared to the long flat knitting history of Mauritius, is a relatively new player in the business. The main hub is in the capital Antananarivo. But with Antsirabe, 4 hours’ drive south of Tana, a second city is getting more and more important for the textile producing industry. Madagascar is still dominated by the hand flat knitting industry. You will find purely locally owned companies as well as Mauritian, Chinese, Italian, French and Dutch owned companies. And wherever foreign ownership is involved, electronic machines play a more and more important role. Currently, even with local salaries still at a low level, our European and Mauritian customers confirm, that investment in electronic machines is becoming more and more profitable than working on hand flats. A high absence rate of employees, as well as long production times for complicated patterns, make it difficult to have a continuous and fast output on hand flat machines. The investment on STOLL machines is, therefore, increasing each year. STOLL customers mainly go for our 2- and 3-system compact machines that give them an optimum on productivity for an attractive price. 2017 even saw the first STOLL ADF (independent direct feeding) machines coming to the market. A STOLL Dutch customer, and proud owner of these machines says, “You always have to show your buyers/customers something special in your collection. Even if it is not yet the right time for these kinds of designs/products, you have to be ahead of your competition”. He strongly believes that the designs, being able to be realized on the ADF machines, will hit the market soon. First swatches shown on international yarn and fabric exhibitions have already strengthened him in his belief. Coming back to the city of Antsirabe, textile producers are installing new factories to make use of an even cheaper labor. But, as already mentioned, cheap labor does not automatically provide a desired output. In general, you have to train more people over a longer period of time to finally get what you need. Today, we have one huge STOLL customer already installed and a second one building up his factory to be operational by the end of 2018. A large quantity of STOLL machines has already been proposed for that project. Main countries are France, Germany, the US and South Africa. If the local government will invest more money in infrastructural programs like new roads, airports and hotels, then the country will definitely see a steep increase in economic growth. STOLL is present and STOLL customers deeply appreciate the service. In the meantime, Kenya became the largest exporter of garments in the sub-Saharan Area followed by Lesotho, Mauritius and Ethiopia. Kenya has a huge weaving industry and mainly produces and exports all kinds of uniforms and traditional Kikoi products (colorful wraps, scarfs). The flat knitting sector is dominated by the production of school sweaters. So far only hand flat machines and basic semi-electronic machines from China and India were/are used for school sweater manufacturing. As living standard is rising, high quality school uniforms are in great demand. One of the major reasons why STOLL is successful in this market. It was already the beginning of the 1980s that the first electronic STOLL machines were imported. The STOLL customer from that time is still in the business and can be seen as the pioneer of all flat knitters in Kenya. Today, STOLL is having a very sound customer base in Kenya, all producing high quality school sweaters on the latest CMS “HP” (High Productivity) version. According to STOLLs customers, “the CMS is the easiest machine in the market to operate”. At the first purchase, all STOLL customers get training by STOLL’s technical department. This specialized training makes the local technicians fit and able to reply to all requested demands. This training makes STOLL unique in the market. There is no other supplier of electronic flat knitting machines offering this service, therefore another important reason why customers are opting for STOLL. As flat knitted fashion items are up to now mainly imported as new or second hand, this field has been quite neglected by local producers. You hardly find a Kenyan knitwear brand or fashion boutiques. But with the assistance of STOLL, by recommending special fashion trade-fairs, yarn suppliers, potential buyers, our (potential) customers are starting to enter this field. Locals are eagerly waiting for fashion items, suitably priced and made in Kenya. Something you would not have been expected is that even shoe uppers are produced in Kenya on STOLL machines. STOLL customers, supplying school uniforms and/or traditional Kenyan garments, see this as a new and huge opportunity to open up a new business field. Economically, Kenya is also moving ahead. The new railroad between Mombasa and Nairobi is helping local entrepreneurs to ship goods in a much faster way to the next seaport and, from there, to Europe or the US. And looking at the environment in general, Kenya was the first country in the world to ban plastic bags. Kenya is moving ahead, also with STOLL.